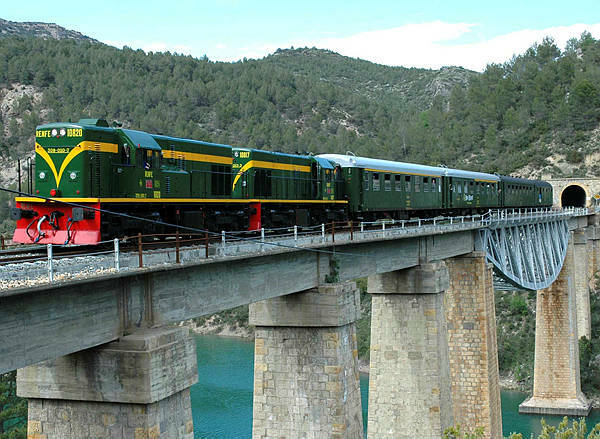 The Lleida – La Pobla de Segur railway line is associated with an old trans-Pyrenean project to connect the city of Lleida to Saint Girons (France) via the Port de Salau (Salau Pass) and an 89.35 km stretch of track. The Spanish state inaugurated the section of track between Lleida to Balaguer in 1924. After the Spanish Civil War, RENFE (the national railway company) was given the task of continuing the project and took the line to Cellers, in 1949, Tremp in 1950, and finally to La Pobla de Segur, in 1951. Although preparations had already been made to take the line as far as Sort, the rest of the cross-border project was subsequently shelved. The section of the line that was constructed runs along the right bank of the River Segre, from Lleida to Balaguer. It is a single track and follows a relatively easy route. But after Balaguer, the line follows the course of the River Noguera Pallaresa and its path is much more complicated. 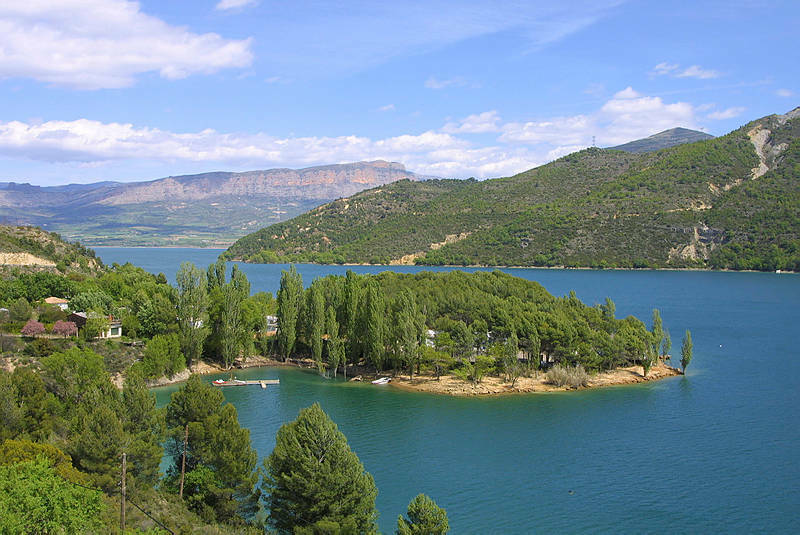 It crosses the sierras of Mont Roig and Montsec, where the spectacular scenery includes: rugged rock walls, gorges and four reservoirs (those of Sant Llorenç, Camarasa, Cellers and Sant Antoni). This part of the route offers spectacular panoramic views and includes a total of 41 tunnels and 31 bridges. 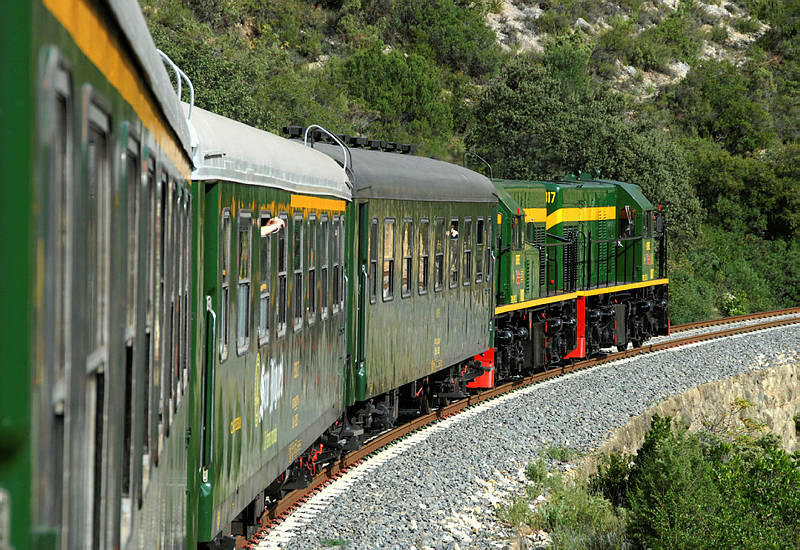 It is possible to travel along part of the line using special services that are provided by old trains. In spring, summer, and autumn (in September and October), there a series of special outings have been organised. 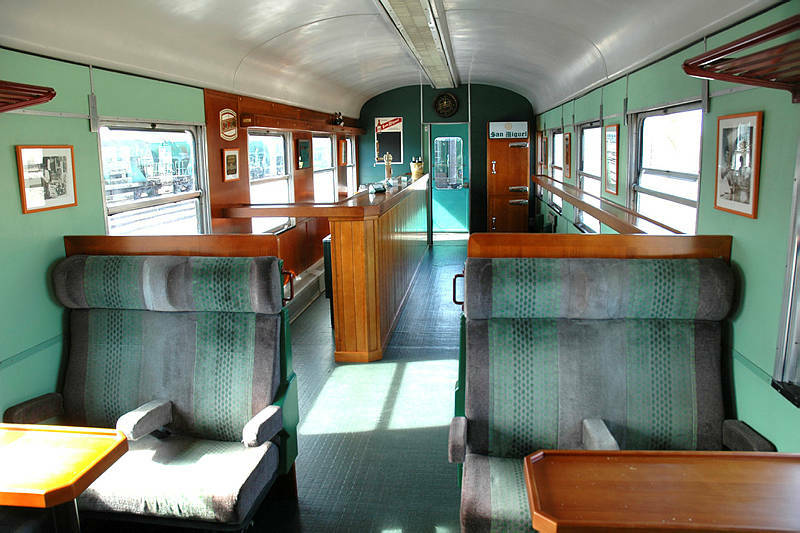 This nostalgic route, which is particularly recommended for railway enthusiasts, is also of interest for the general public. The scenery makes everything worthwhile and on reaching the end of the route, it is possible to enjoy a few of the complementary guided visits that are full of interest for tourists. The carriage windows provide views of very beautiful scenery: a rough, wild territory, full of crop fields, towering walls of limestone, and calm waters... and in the background, the snow-capped summits of the Pyrenees. 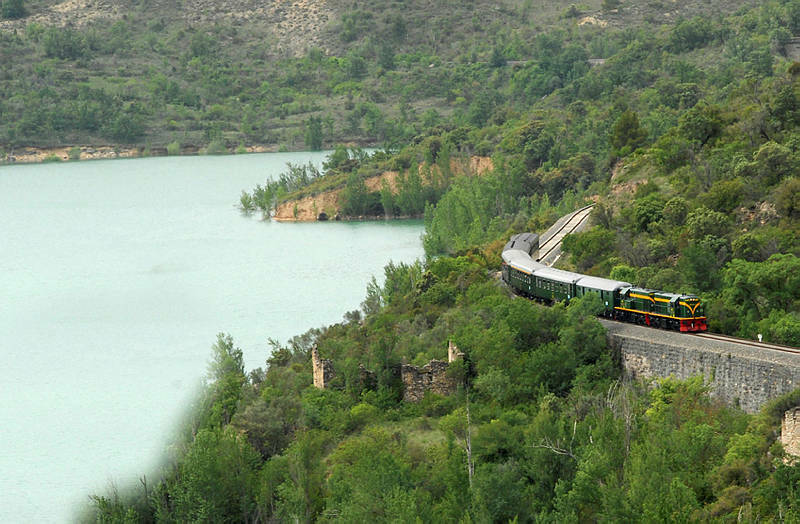 EL MONTSEC: Travelling on the Tren dels Llacs (Lake Train) is a good way to discover El Montsec. 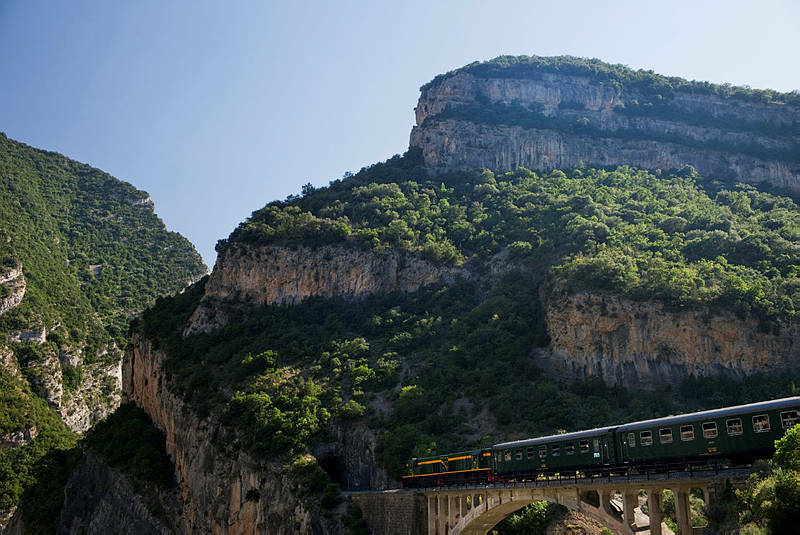 The railway line crosses the imposing massif, following the course of the River Noguera Pallaresa through the Terradets pass, where tunnels, bridges and viaducts help it to pass the cliffs of this limestone range, which is over 40 km long. The persistent force and erosive might of the rivers Noguera Pallaresa and Noguera Ribagorçana managed to carve a route through these walls of rock and created the spectacular gorges of Mont Rebei and Terradets. The maximum altitude of this mountain range is 1,676m and each of its stones bears witness to the passage of time and the geological processes that have shaped it. 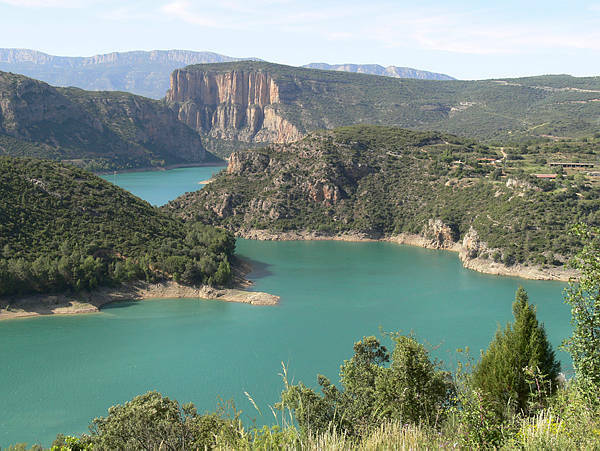 THE RESERVOIRS: There are four fantastic extensions of water along the route: Sant Llorenç de Montgai, Camarasa, Cellers and Sant Antoni. Their calm, clear, blue waters reflect the abrupt peaks of El Montsec and are veritable paradises for all manner of water sports. In fact, these are constructions that date from the first third of the 20th century. They were created in order to provide drinking and irrigation water for the local populations and to generate electricity for the cities, towns and villages of Catalonia. GEOLOGY AND PALAEONTOLOGY: Nature and history become one. Interpreting a section cut through the cliffs of this territory is like reading a book about geomorphology. The fossils tell us how, 140 million years ago, this territory was a marine basin and that this was also a passing place for the dinosaurs that suddenly disappeared 65 million years ago. Remains dating from the Cretaceous period have been found at many different sites, but particularly in the Conca Dellà. There are a great number of caves and ravines, including: the Cova dels Murisecs, Forat de l’Or, and Forat de Buli... which are irresistible for cave hunters and those who love canyoning. SPORTS AND THRILLS: the great variety of natural spaces that are near the railway line make this an ideal setting within which to enjoy a wide range of sporting and leisure activities that take advantage of this privileged natural environment and its resources. This is an excellent place to enjoy sports in the great outdoors: the thrills of free flight and paragliding from the cliffs of El Montsec; climbing the almost vertical rock walls of Terradets; exploring the caves; or engaging in numerous water activities on and in its reservoirs. This is also an area to explore on foot, on horseback, or by bicycle, in order to discover the beauty of each hidden corner of its countryside. Leisure options are provided by the MTB Centres of El Montsec-Noguera and La Pobla de Segur. Other, more relaxing, options include fishing and hunting, while ramblers can enjoy the long, dense network of sign-posted walking routes and the GRs that cross this territory. Specialised observers will find perfectly sign-posted itineraries that will take them to places where it is possible to see birds of various different species. It is also possible to hire nature guides to help locate the most treasured species. Amongst these rugged mountains and around the reservoirs, there are camouflaged observatories from which it is possible to follow the route of an eagle, or a bearded vulture through the Vall dels Voltors (Vulture Valley)! THE MONTSEC ASTRONOMICAL PARK: The relative absence of light pollution around El Montsec and the darkness of its skies have helped make this an almost perfect place for astronomical observation. The magnificent facilities of the Parc Astronòmic del Montsec (Montsec Astronomical Park) offer visitors the possibility to conduct astronomical observations while having access to the latest technology and best scientific and pedagogical resources available.